Former President Gloria Macapagal Arroyo mugshot images or photos have been leaked and was even published on the front page of the Philippine Daily Inquirer. The mugshots showed three angles of CGMA wearing a neck brace while lying on a hospital bed with the words “Gloria Macapagal-Arroyo Crim Case # R-PSY-11-04432-CR” printed at the bottom. This in spite of the ruling of Pasay City Regional Trial Court Branch 112 under Judge Jesus B. Mupas against its release. Arroyo may file a case against those who will be caught publishing them the court added. 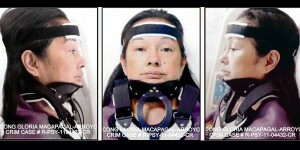 The mugshots showed three angles of CGMA wearing a neck brace while lying on a hospital bed with the words “Gloria Macapagal-Arroyo Crim Case # R-PSY-11-04432-CR” printed at the bottom. The police have confirmed the authenticity of the leaked images and photos. for me either she was telling or not i wouldn't take a chance to blame her although he brings a lot of pain on people around Philippines. i would not practice myself to judge people around me. my mind always tells me what if it is true that she was very ill and needed foreign equipments to cure her. i always believe a country with a helping hand is aiming for a high progression.